Cobblers boss Justin Edinburgh has suffered a second big injury setback in the space of a few days with the news that top scorer Alex Revell will be out of action for up to six weeks with a calf injury. The blow comes less than a week after Sam Hoskins saw his season ended as he suffered a cruciate knee ligament injury in training last Thursday. 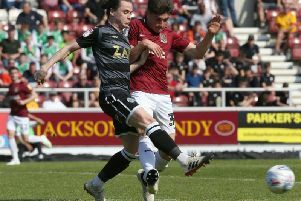 Revell, who has scored 10 times this season and been one of the Cobblers’ most consistent performers, suffered his injury to the calf muscle on his right leg midway through the first half of Saturday’s 5-3 Sky Bet League One defeat at Milton Keynes Dons. Edinburgh revealed on Tuesday morning that a scan undertaken on Monday has confirmed the former Rotherham United and Cardiff City man will be out ‘for four to six weeks’. That means the striker is set to be unavailable until the trip to Fleetwood on February 25 at the earliest, which would rule him out of matches against Coventry City, Walsall, Chesterfield, Swindon Town and Southend United. In other injury news, there has also been a slight setback for right-back Brendan Moloney as he bids to recover from his knee problem. The Irishman has seen a specialist about swelling on the injured knee and has had to have it drained. He is now once again building up and working hard his recovery, although Edinburgh says he is likely to be missing for ‘another couple of weeks’. Of the other injured players, there is better news. Full-back Aaron Phillips is now back in full training and will be available for Saturday’s clash against his former club Coventry City, while Paul Anderson is also expected to be fit for that one having recovered from the gashed knee injury he sustained at Bristol Rovers. Central defender Rod McDonald is currently working on easing the back strain that kept him out of the weekend trip to Milton Keynes, and Edinburgh is hopeful he could return to full training on Thursday.